After all these ladylike gift guides this week, I figured maybe it was time to have a guide that knows no gender. 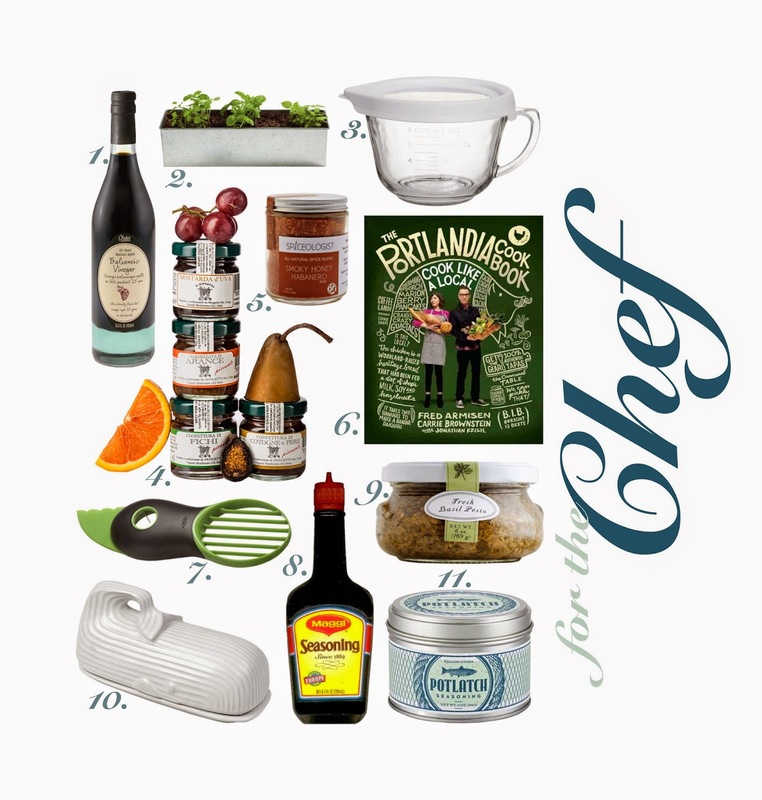 The only requirement for this gift guide is that the recipient likes to cook. Heck, some of these are actually good gifts for someone who only uses a toaster. And no, #1 is not a bottle of wine. I'm fairly sure I'm the last person you want suggesting a bottle. That, my friends, is Balsamic Vinegar. But I'm getting ahead of myself. Links below! I've often said I could drink Balsamic Vinegar, and that's just the cheap kind. Imagine how good this stuff is! What's better than your own fresh basil? Get the freshest basil possible from your very own plant. These are super great if you have something that makes several batches. Keep the batter in the fridge until you're ready for the next batch. Though this isn't exactly an ingredient, it is great for a party tray. I don't think this level of heat is for the faint of heart, but it sure does sound good. For the cook who's also into comedy. For that friend of your who likes to make their own guacamole...or just put avocado on everything. This is one of the key ingredients in making your own Banh Mi, but I hear it's great for a lot of other things, too! Imagine tomato mozzarella sandwiches with this spread on come ciabatta. Delish. You don't have to be a chef to love a cute butter dish. In fact, you can just be an avid carboholic...or dairy fan, for that matter. This isn't just for fish like the packaging suggests. It's a great spice that helps lots of different dishes. And it comes in this nice tin! Here's Hoping whoever receives these gifts invites you to dinner.